Exiled Russian tycoon Boris Berezovsky reportedly committed suicide at the age of 67, according to a Facebook post by his son-in-law Egor Schuppe. Exiled Russian tycoon Boris Berezovsky has died at the age 67, according to a Facebook post from his son-in-law Egor Schuppe. Details regarding the nature of his death are yet to be released. His death has not been officially confirmed, and details have not been disclosed. According to Schuppe, Berezovsky was recently depressed. He failed to keep in touch with friends and acquaintances, and often chose to stay at home rather than go out. Damian Kudriavtsev, the former CEO of Kommersant Publishing House also commented on the businessman’s death saying he passed away at 11:00 GMT in London. On his twitter account, Kudriavtsev said there were no signs of a violent death. Aleksandr Dobrovinksy, a famous lawyer and head of Moscow-based The Alexander Dobrovinsky & Partners law firm has said that Berezovsky committed suicide. “Just got a call from London. Boris [Abramovich] Berezovsky committed suicide. He was a difficult man. A move of disparity? Impossible to live poor? A strike of blows? I am afraid no one will get to know now,”the lawyer said on his social network page. Berezovsky made headlines this week, after news broke that the tycoon was auctioning off an Andy Warhol portrait of Soviet leader Vladimir Lenin. The oligarch was planning to sell his limited edition ‘Red Lenin’ print in hopes of paying off creditors and legal bills, the Times reported. The 1987 portrait has been estimated by Christie's to be worth between $45,000 and $75,000, and is reportedly in excellent condition. Berezovsky left Russia in the late 1990s over a money laundering scandal with Aeroflot airlines. He has been on Russia’s wanted list since 2001 on charges of fraud, money-laundering and attempted violent power takeover. In 2007, a Moscow court found him guilty in absentia of stealing 215 billion rubles from the company and sentenced him to six years behind bars. The tycoon was given a total of 19 years in prison by a number of Russian courts over various charges. He claimed the cases against him were provoked by Russian President Vladimir Putin. 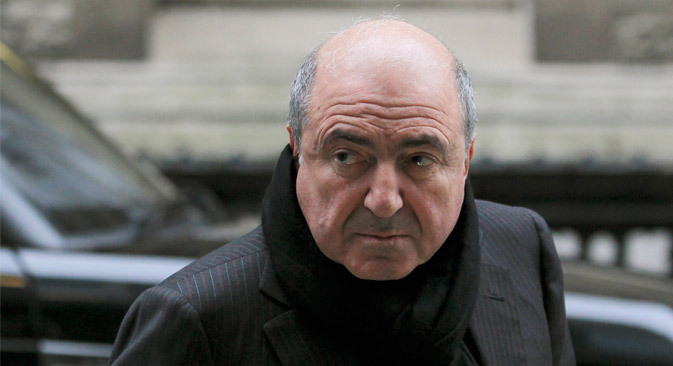 In 2003, the UK granted Berezovsky political asylum.